Twitch Prime and Nintendo are teaming up to offer Twitch Prime members up to a full year of the Nintendo Switch Online service. *Persistent Internet, Nintendo Account age 13+ and compatible smartphone required to use app. Data charges may apply. Online play, Save Data Cloud backup and Nintendo Switch Online smartphone app features available in compatible games. Not available in all countries. The Nintendo Account User Agreement, including the Purchase and Subscription terms, apply. nintendo.com/switch-online. Offer only available in select countries. Nintendo Account linked to Nintendo Switch console required. 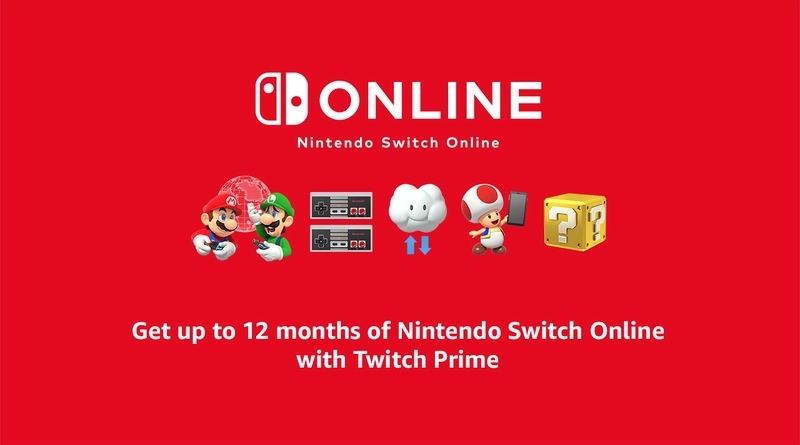 Active Twitch Prime account age 13+ for two consecutive months required to claim additional 9-month Nintendo Switch Online membership at no extra cost. Nintendo Switch Online Family Membership holders are not eligible. A credit card or linked PayPal account required for users age 18+. Nintendo Switch Online membership will automatically convert to a 3-month membership for $7.99 US for 3 months unless automatic renewal is turned off any time up to 48 hours before the end of the initial 3-month membership. Three-month memberships must be redeemed by September 28, 2019 and nine-month memberships must be redeemed by January 28, 2020.